If I were told that I could only have one food for the rest of my life, it definitely would be pizza. If you grew up in the 70’s and 80’s you most likely only went out to eat if it was a special occasion. My husband and I used to joke that our kids went out to eat more in one month than we both did in a year growing up! 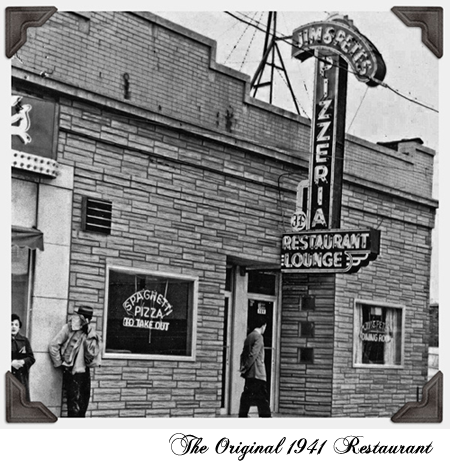 It was a special occasion to order pizza, and my first love affair with pizza began with Jim & Pete’s on North Avenue in Elmwood Park. 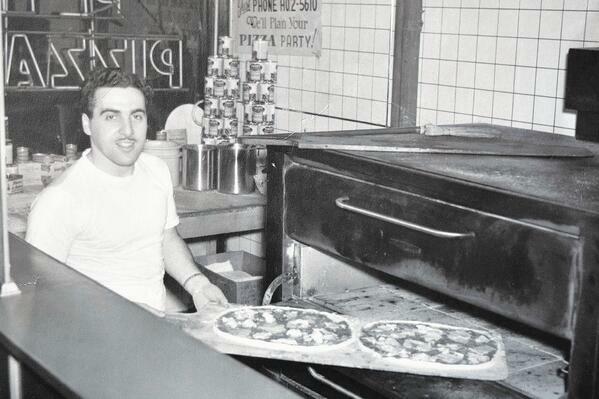 It’s a family run pizzeria that’s been in existence since 1941. When it was declared pizza night, I jumped at the chance to ride along with my Dad to go pick it up. Back then, they put their pizzas into paper bags and stapled the end of the bag. I remember sitting shot gun to my Dad, gently holding the pizza off my lap because it was so hot, while also pulling the paper bag up so that it wouldn’t sit on the melty delicious cheese. I literally could barely wait to get home to dive into that pizza. Maybe that’s why I declared Friday night Party Pizza Friday. For as long as I can remember, I’ve made pizza nearly every Friday night. 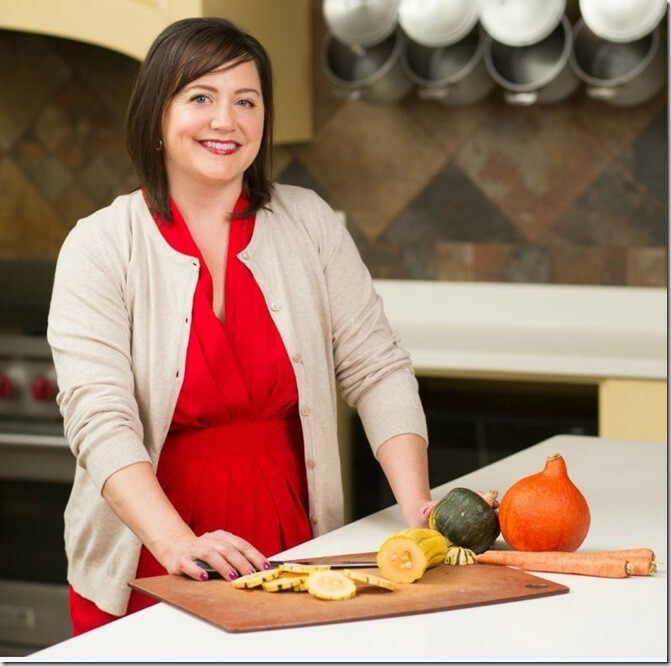 My husband didn’t have the same love affair of pizza as I did, so I always switched it up! We had Mexican pizza using enchilada sauce and refried beans for the base, with shredded chicken, Chihuahua cheese and fresh cilantro; Reuben pizza with a rye dough, thinly sliced corned beef with sauerkraut, caraway seeds and Swiss cheese – you get the idea. It wasn’t until we were married a couple years that all of a sudden he suggested we go out on Friday night. Huh? Okay! It wasn’t until the third week in a row that he made this suggestion that I realized he just didn’t want to eat pizza! As any good wife would do, I still maintained my Party Pizza Friday for myself and daughter, while I cooked my husband a steak and baked potato, and that made everyone happy. 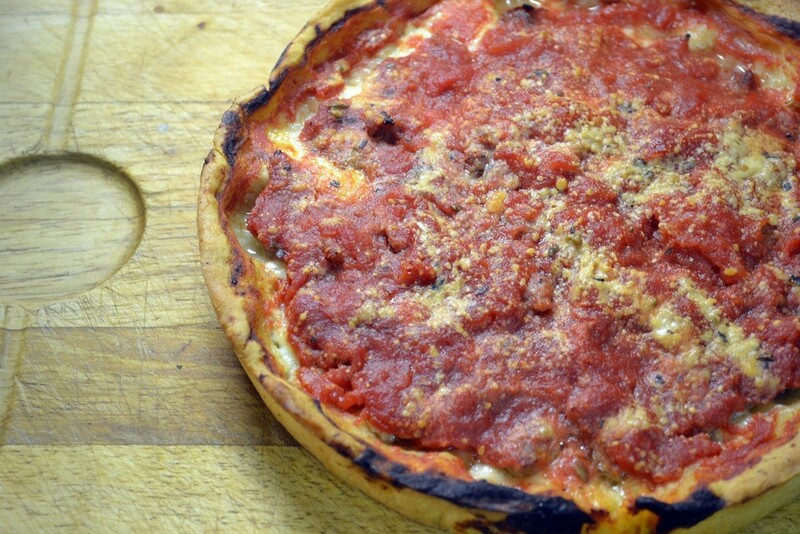 For the longest time, I never attempted to make a Chicago Style Deep Dish Pizza at home because I thought it would be too complicated. Imagine my surprise when I came home from work one day and my husband ASKED me to make pizza: a Chicago-Style Deep Dish Pizza. I had to accept that challenge! While this recipe may seem long, it’s really not that complicated. This is a copycat of Lou Malnati’s Pizza. 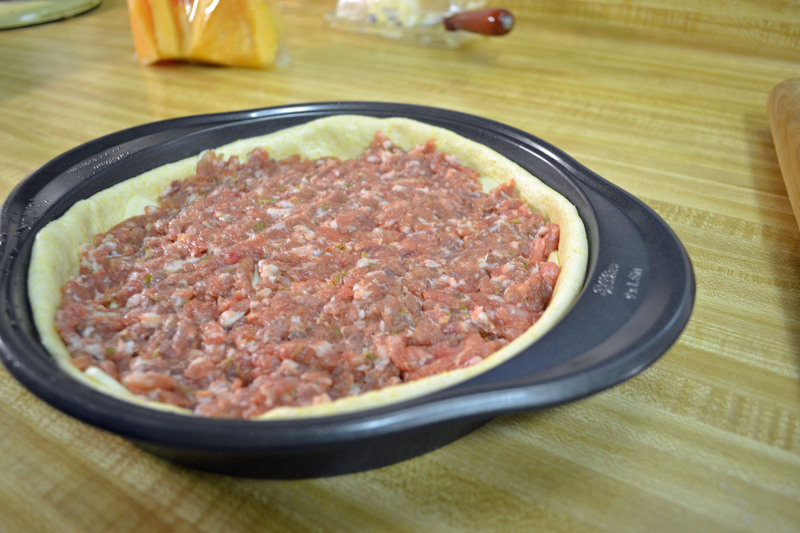 It has cornmeal in the homemade pizza dough and most importantly, softened butter spread on the dough prior to baking. Butter makes everything better, right? Mix flour, cornmeal, salt, sugar, and yeast in bowl of stand mixer fitted with dough hook on low speed until incorporated, about 1 minute. Add water and melted butter and mix on low speed until fully combined, 1 to 2 minutes, scraping sides and bottom of bowl occasionally. Increase speed to medium and knead until dough is glossy and smooth and pulls away from sides of bowl, 4 to 5 minutes. (Dough will only pull away from sides while mixer is on. When mixer is off, dough will fall back to sides. 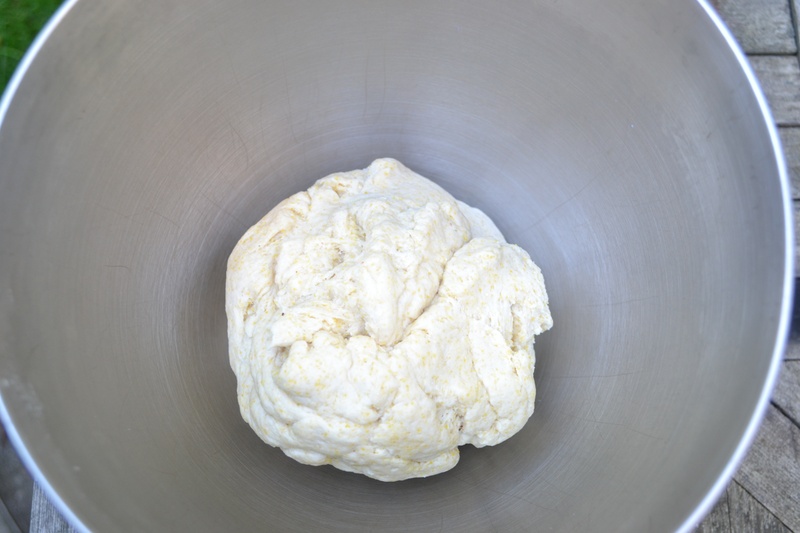 While dough rises, heat butter in medium saucepan over medium heat until melted. Add onion, oregano, and 1/2 teaspoon salt; cook, stirring occasionally, until liquid has evaporated and onion is golden brown, about 5 minutes. Add garlic and cook until fragrant, about 30 seconds. Stir in tomatoes and sugar, increase heat to high, and bring to simmer. Lower heat to medium-low and simmer until reduced to 2 1/2 cups, 25 to 30 minutes. Off heat, stir in basil and oil, then season with salt and pepper. Adjust oven rack to lower position and heat oven to 425 degrees. 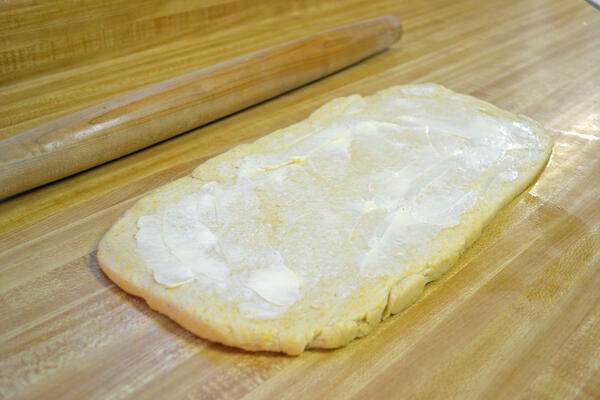 Using rubber spatula, turn dough out onto dry work surface and roll into 15- by 12-inch rec-tangle. 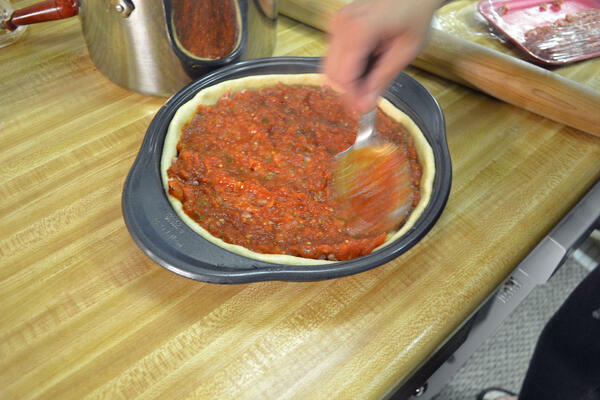 Using offset spatula, spread softened butter over surface of dough, leaving 1/2-inch border along edges. 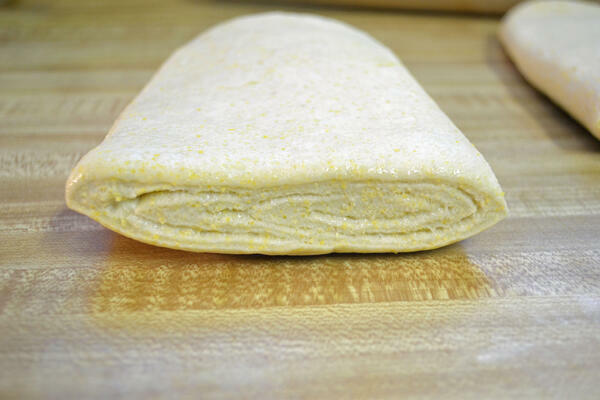 Starting at short end, roll dough into tight cylinder. With seam side down, flatten cylinder into 18- by 4-inch rectangle. Cut rectangle in half crosswise. Working with 1 half, fold into thirds like business letter; pinch seams together to form ball. Repeat with remaining half. Return balls to oiled bowl, cover tightly with plastic wrap, and let rise in refrigerator until nearly doubled in volume, 40 to 50 minutes. 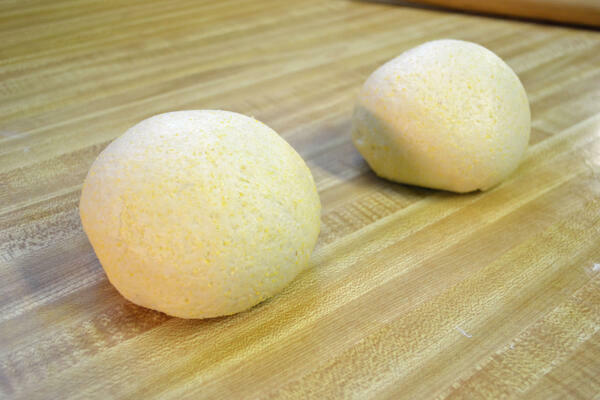 For each pizza, sprinkle 2 cups mozzarella evenly over surface of dough. Add the sausage. 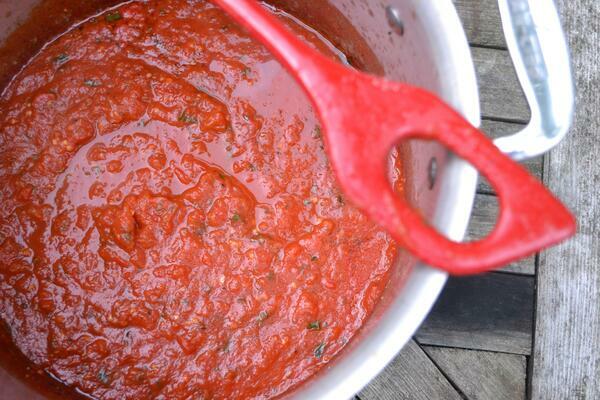 Spread 1 1/4 cups tomato sauce over the sausage and sprinkle 2 tablespoons Parmesan over sauce. This is hands down the best deep dish pizza recipe I’ve made at home. 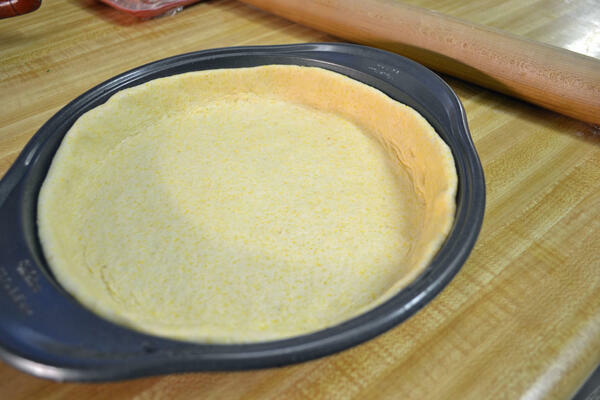 The crust is buttery, and you don’t need any special equipment other than a cake pan. It's now one of my favorite pizza recipes! 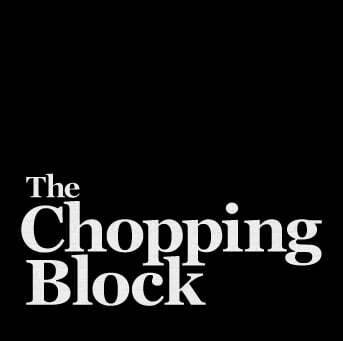 If you are interested in learning how to make pizza in your own home, The Chopping Block's Neapolitan Pizzeria cooking class is coming in up in both locations – October 8 at Merchandise Mart and October 12 at Lincoln Square. Sun-Dried Tomato, Smoked Mozzarella and Arugula Pizza. You’ll learn how to make a great tomato sauce; how to balance flavors; make your own yeast dough (so easy once you try it!) and cook on a pizza stone. Hope to see you there so we can share our love of pizza!